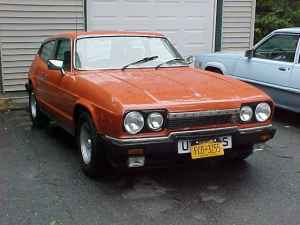 1978 Reliant Scimitar - I'm pretty certain that this is the same car I posted back in April, 2009. As I wrote in that post, this is another one of those great "cottage industry" cars from Great Britain. I wish more of them had made the trip to America. The 2009 post has a bunch of links to sites dedicated to the Reliant. You can find it here. Located in Tomkins Cove, NY, click here to see the Craigslist ad. 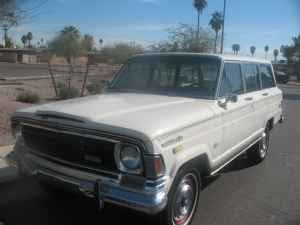 1973 Jeep Wagoneer - I like this a lot. This is one of the last "plain" Wagoneers. Within a few years the Wagoneer would become a luxury SUV and be rebadged as the Grand Wagoneer. This Wagoneer looks to be in amazingly good condition. Rust was the big enemy of the Wagoneer and this Arizona vehicle looks to be rust free. Here in New England, this SUV would sell for at least half as much more than the seller's asking price of $2500.00. Located in Mesa Arizona, click here to see the Craigslist ad. 1977 Triumph TR7 - I really can't come up with a good reason to buy a TR7 coupe instead of a TR7 convertible. (I tried.) The convertible looks a lot better and was better built. Triumph sold quite a few of these cars in the US, yet very few remain. This car is a survivor and is in fairly nice shape. Sometimes that's reason enough to buy a car. Located in Eugene, OR, click here to see the eBay listing. I just came up with a good reason to buy this car. When I parked my car in the driveway tonight, the outside temperature readout said it was -2 degrees (Fahrenheit). Tonight, given the choice of a heat retaining hardtop or a chilly soft top, I'd take the hardtop. The Reliant - I used to think "Princess Anne" every time I saw one of these. She had a number of them... But recently the mere mention of "Reliant" has me thinking about how Top Gear UK has been torturing Robins. Jeep - That Wagonmaster guy from Texas is still around. His "woody" wagons sell in the $25K - $35K range. I'm thinking a few rolls of wood grained contact paper might make this a true bargain. Triumph TR7 - These cars are the equivalent of those "sultry, but dangerous" women featured in those WW2 training films concerning the dangers of VD (venereal disease). I know the seller of the TR7, great guy and a straight-shooter. Great eBay feedback ratings, great cars and an oddball inventory- he has a 1960s Daimler sedan, a Lancia Scorpion, a Honda AZ600, a TR8 tribute car and a C4 Corvette on-site now.